Like many an exclusive club, the medical profession subjects its prospective members to rigorous indoctrination: medical students are overloaded with work, deprived of sleep and normal human contact, drilled and tested and scheduled down to the last minute. Difficult as the regimen may be, for those who don't fit the traditional mold—white, male, middle-to-upper class, and heterosexual—medical school can be that much more harrowing. 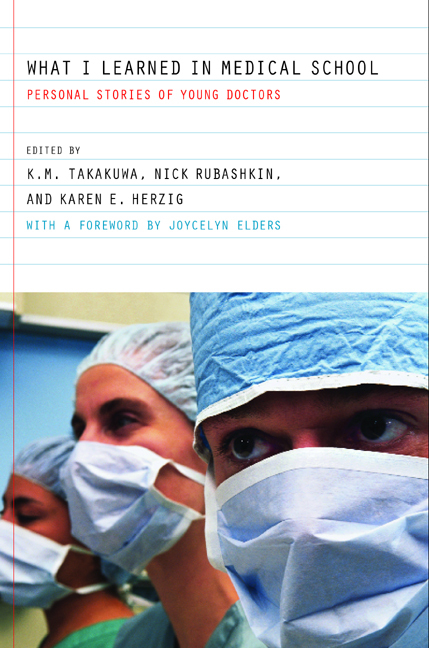 This riveting book tells the tales of a new generation of medical students—students whose varied backgrounds are far from traditional. Their stories will forever alter the way we see tomorrow's doctors. In these pages, a black teenage mother overcomes seemingly insurmountable odds, an observant Muslim dons the hijab during training, an alcoholic hides her addiction. We hear the stories of an Asian refugee, a Mexican immigrant, a closeted Christian, an oversized woman—these once unlikely students are among those who describe their medical school experiences with uncommon candor, giving a close-up look at the inflexible curriculum, the pervasive competitive culture, and the daunting obstacles that come with being "different" in medical school. Their tales of courage are by turns poignant, amusing, eye-opening—and altogether unforgettable. Kevin M. Takakuwa is resident physician at the University of Pennsylvania. He is a graduate of the medical school at the University of California, Davis. Nick Rubashkin is a medical student at Stanford University. Karen E. Herzig earned a Ph.D. in health psychology from the University of California, San Francisco, where she currently works as a researcher. 9. Why Am I in Medical School?